Puck Pentenga looks to play a pass. The senior midfielder provided an assist against Michigan. For the past two seasons, whenever Northwestern has taken the field in a major game — whether it be for a share of the Big Ten regular season title, in the Big Ten Tournament or in the NCAA Tournament — and lost, it has been against one team. It happened three times in 2017 and earlier this year, No. 7 NU (9-10, 3-5 Big Ten) lost to the No. 2 Wolverines (13-5, 7-1) and proceeded to lose four of its next five contests to end the Big Ten campaign, setting up a conference quarterfinals matchup with Michigan on Sunday. The fifth iteration of the battle followed the same script as the first four as the Wolverines won the matchup — this time a 3-1 win in Ann Arbor — with Emma Way playing a key role for the victors. After playing scoreless field hockey for 26 minutes, Michigan broke through with two goals in a three-minute stretch. First, Abbey Hutton received a pass in space in the Wolverines’ attacking third and fed Way, who spinned and took a shot that was blocked by junior goalkeeper Annie Kalfas. However, Way collected the rebound and sent her second shot into the back of the net. Then, Meg Dowthwaite received a long pass in the attacking circle and fired a backhanded shot that got past Kalfas and found its way just inside the far post to put Michigan up 2-0. The Wolverines were held scoreless for over 30 more minutes before Fay Keijer played a ball from the touchline into the area right in front of goal. 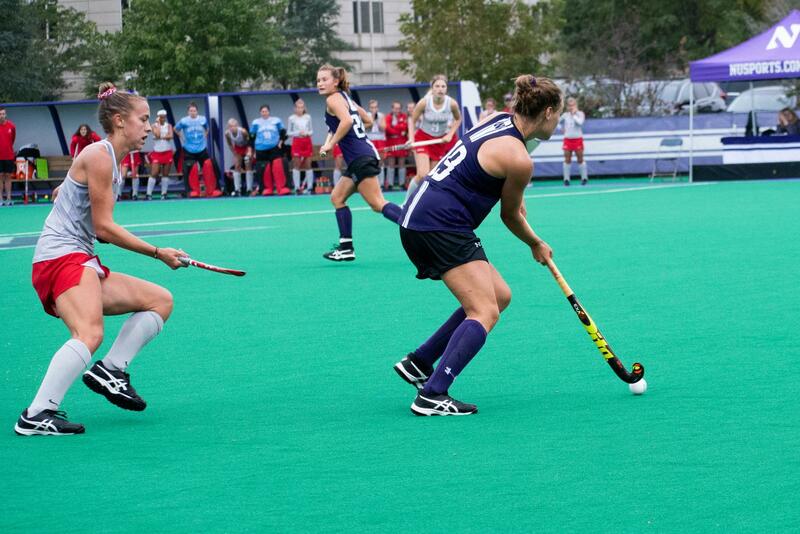 The ball took a redirection of a defender and trickled over the line for Michigan’s third goal of the game. The Cats were able to respond quickly to Keijer’s strike, but it was too little, too late. Earning a corner less than a minute after the goal, senior midfielder Eva van Agt deflected a shot from senior midfielder Puck Pentenga to cut the deficit to two. In total, the Wolverines outshot the Cats by 19, taking 24 shots compared to five for NU. Michigan also had 10 penalty corners compared to four for the Cats. With the loss, it appears that the Cats season is over. Only eight at-large bids are given out for the NCAA Tournament and with NU having a losing record and ranked as the No. 22 team in the country in RPI, the odds are extremely unlikely of the Cats playing another game. That means the careers of NU’s senior class — which includes van Agt and Pentenga — is most likely over. Fuchs said she wishes the Cats had won a few more games this season in order to give the graduating players one final run in the NCAA Tournament.